To quote Heather O'Rourke in Poltergeist, "They're heeere!" The Scratching Post is back from beyond the grave. Check out the Archives to see what kind of greatness you've been missing. What's the Scratching Post, you ask? 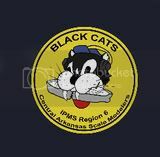 Well, Central Arkansas Scale Modelers, CASM for short, is the home of the Black Cats (get it? I thought you would... ) and the Scratching Post is a place for us to share news, ideas, thoughts, techniques, reviews, and much, much more. CASM has been all about sharing, lately. The past few months have been stocked full of new things for us to share the love of modeling, and our club, with you. We have a new look to the website and forum, we are recording monthly demonstrations, and streaming our meetings LIVE! We want to share with you all the time, so we have brought back the Scratching Post in a new form: The Scratching Post Blog! With all this sharing going on, CASM officers decided we needed some help with this latest project. So we contacted our dear (though not so near!) friend, "UK Mike" Mcellaney, to be the coordinator and moderator for the Scratching Post. Thanks, Mike! In order to keep things going, we need to hear from you! We know that taking photos and writing articles can seem daunting, so we're going to show you how. The demos for the next three months have been scheduled to show each of you how to best share your modeling in devours. Ken is going to show us how to use a simple camera to take amazing photos of our models. He's going to give tips on lighting, backgrounds, and how to utilize the camera's built in features. Steve will share with us how to write clearly and concisely to best show our thoughts and ideas without confusing ourselves and other readers. Brianna is going to wrap everything up by showing you how to navigate the website, post pictures and links on the forum, and submit articles. So that's it! That's the game plan. Hold your breath and wait for our next big issue. If you begin to turn blue or feel light headed, take a deep breath and start over... In the mean time, go build something! We need those articles!